She Yelled. I Screamed...She Pulled My Hair! : An Un Fairy Tale by Tracy Leshay is an adorable story of two sisters, Phoebe and Audrey, their fights, playful moments, and emotions. Both the sisters are playing one afternoon and they don't share a toy properly. 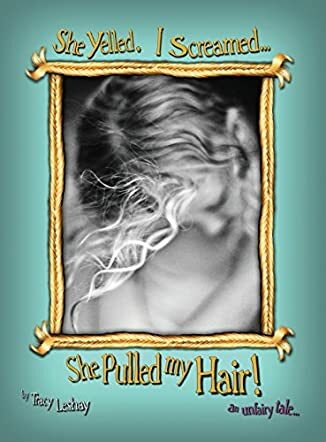 Readers see Audrey screaming at Phoebe and pulling her golden locks one hot afternoon. The author captures the tiff between the two sisters very well, making it real and tangible to readers. Phoebe meets a winged lady who tells her about the sharing spell she has and asks her to wave a leaf at her sister Audrey to make her share her things. Will it work for Phoebe? Will Audrey change and start sharing? The book is refreshingly original and the photographs make the story come alive. It's a good bedtime storybook, as well as a book for read aloud sessions in classrooms and school libraries. The entire story and the pictures are very aesthetically presented and will make kids look at it in a very creative and imaginative way. There is a subtle message of kindness in the story which teaches kids to share their things. It's ideal for kids who have siblings as it will teach them to share their things, and to love and respect each other. Books with messages, morals, and concepts are good for children, enabling them to understand the concept easily through the story. The book is written with a lot of warmth and love. An adorable storybook for kids that teaches them about love and sharing.